Jacob Erickson, Ph.D. candidate in the Department of Sociology, received the Extra Yard for Teachers honor during the September 15 Iowa State University football game against the Oklahoma Sooners. 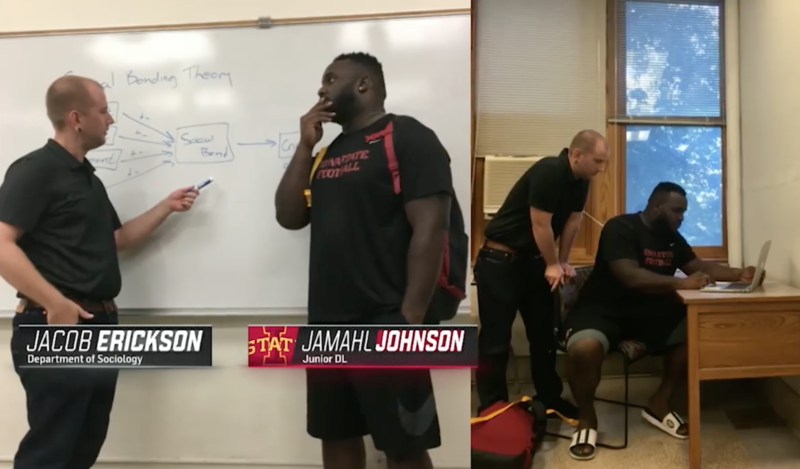 Erickson was nominated by Iowa State Cyclone football player Jamahl Johnson. Johnson, with the help of Erickson, raised his GPA from a 2.2 to a 3.2. "At first I was shocked. You hope you are positively affecting people, but it can be hard to know," said Erickson. "It was certainly energizing. To know that you have had a real impact on at least one person makes you feel like you must be have been doing something right. I’ve wanted to be a teacher since I was in high school so it was an affirming experience." While Erickson always wanted to teach, he picked up cues from his mother, an elementary school teacher and principal, on what it means to be a good teacher. "The thing I most actively try to do in my classes and with my students is decrease social distance. I actively discourage students from calling me ‘professor’ or ‘Mr. Erickson,’" Erickson explained. "By the time young people get to college they’ve been listening to Mr. and Mrs. their whole life and they’re tired of it. They want to be treated as equals with opinions and knowledge of their own." Though Johnson nominated Erickson for the honor, Erickson believes that Johnson deserves the credit. "I think he might be giving me too much credit. Jamahl is bright. He just needed time to figure things out for himself," said Erickson. However, without the help of good teachers have a team mentality and view students as people who need support and encouragement, students may never make those discoveries. "I think by acting and treating students like I’m just a person with things to learn, and not a stuffy expert who is there to bless them with my academic expertise, students are more open to listening and most importantly engaging in discussion."